Tíg na Fáilte is a comfortable and welcoming holiday home on West Cork’s stunning Sheep’s Head peninsula. This lovely Irish holiday home on West Cork’s Sheep’s Head peninsula offers wonderful views of Dunmanus Bay from the living room, kitchen and all three bedrooms. The master bedroom with double bed and en-suite, is on the first floor, while the other two double bedrooms are on the ground floor. The main living room, opening off the kitchen/dining room, has 2 couches, an armchair and an open fireplace. It also features a TV and DVD player, music system and well stocked book shelves with local guides and maps. A second ground floor room is stocked with toys and games. The house has WiFi access. The kitchen is equipped with facilities for the adventurous cook and is laid out for ease of use, with dishwasher beside the sink. A sliding door gives access to the patio from the living room. A barbecue and set of garden furniture are on the patio, overlooking the bay. The adjacent garden to the side of the property has swings and a slide for children. Hedging along the lane guarantees privacy. The area abounds in activities such as swimming, fishing, hill walking and horse riding. 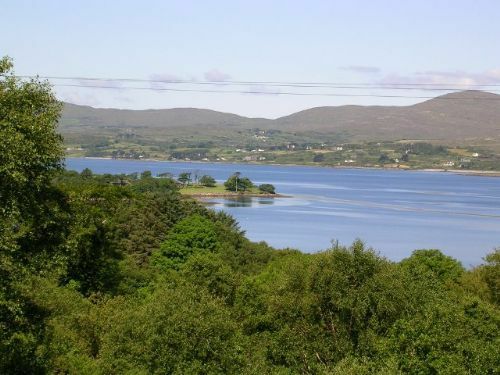 This holiday home gives you easy access to the incredible beauty spots of West Cork and Kerry. Rates: See website for details.